Smashbox is a brand I've wanted to try out for a long long time but have just never got round to it. So when I popped into Boots on that dreaded Black Friday morning to see what they had on offer I was overly excited to see this little treat on the shelves. 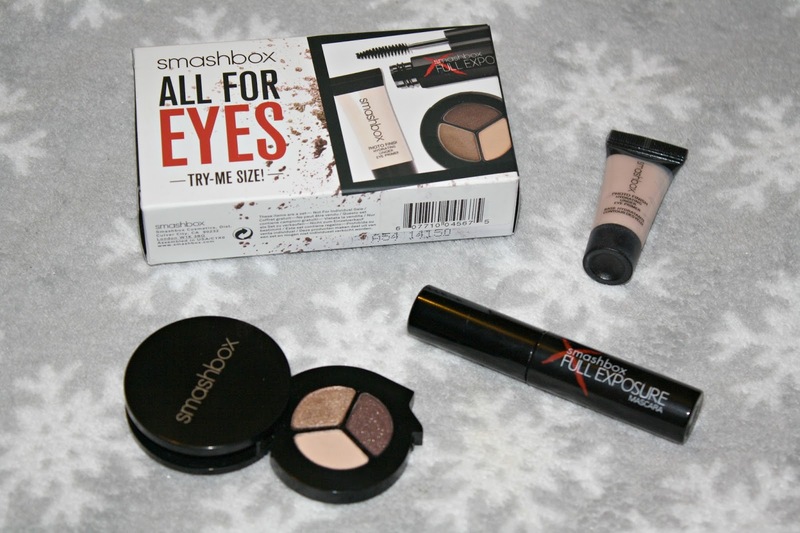 It's Smashbox's All For Eyes Kit in a 'try-me size'. The product I've been enjoying the most is the Photo Finish Under Eye Hydrating Primer - hellllllo flawless under eye concealer application. I've heard good things about the Full Exposure Mascara but I found it just didn't match to expectations for me. It gives a nice length to the lashes but not so much on the volume side I found. However, I've liked using this as a bottom lash mascara instead. Finally in this kit was a Photo Op Eye Shadow Trio in Screen Shot which has amazing pigmentation that lasts all day. The shades wouldn't be my usual first choice but made a nice change to my everyday make-up routine. Now I've had a little taste of what Smashbox has to offer I'm definitely eager to explore more of their range - especially their primers.